Three years ago, almost to the day, General Strike posted an article about their CUC experience: a close-fought, roller-coaster of a game in the final of the Canadian championship. And it was eye-catching because it raised a very powerful question for teams everywhere: how do you define success? It’s a simple question, but horrifying in its magnitude. If you’re not successful, does that make you a failure? 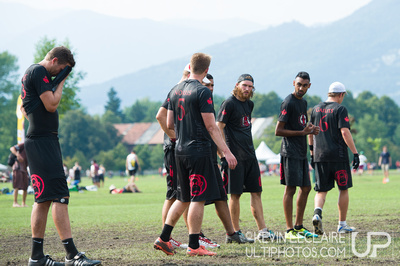 Furious George qualified for the Canadian Ultimate Championships today, taking the first bid out of B.C., and the top seed out of the West. We earned the victory in decisive 15-7,15-3,15-3 wins, although not always with the kind of efficient aplomb we are trying to drill into habit. We practiced various iterations of man-to-man and zone defenses that we are cultivating for use in August, and we continue to try to refine our offense into something less like an enthusiastic chaos. The theory is that when the machine is finished, it won’t matter which part we play — it will trundle down the field as designed, as we each do our jobs. That will come; for now though, we have accomplished step one. If you were born in the eighties, then you probably know something about hard video games. I speak, of course, of the notorious classics – Contra, Megaman, Battletoads — ­­ that pitch you into the fray at maximum difficulty without warning or reprieve. Our parents probably didn’t appreciate that we were doggedly building character against 8-­bit adversity, but we were. We learned to deal with frustrations, to set goals, to maintain focus, the necessity of doing things right, and on happy occasion, to enjoy a seat-of-your-pants wild success. And in reflecting on the U.S. Open, we revisited that experience. Welcome to the next level, ladies and gentlemen. Someone remarked that, given the relative quiet on the blog, you would think that nothing is happening. The problem is quite the opposite. Everything is happening. Every year, the Monkey’s face changes a little, and once again, we add to those who wear the Furious red. This, however, represents our largest-ever stable of players, combining two professional leagues and multiple national teams, united in the common pursuit of excellence. If your name appears here, remember that this is not the end of the road, but the beginning of opportunity. Welcome to the fold. Thank you to everyone who expressed their interest in the April Fool’s edition of Furious George. Notwithstanding that, it is time to launch the official Furious season (yes, in the Open Division). I was walking through customs at Vancouver International, answering the usual gamut of questions. It was late. The lengthy layover in Portland spent on pumpkin ales had left me lethargic, and given to perfunctory responses. Looking skeptical but satisfied that I wasn’t lying, the officer waved me through. Admittedly, posting updates to the site fell by the wayside late this summer. And apparently, that hiatus was noticed, as evidenced by some of the e-mails that have been coming in. * In my own defense, I have been excusably stressed and busy. I don’t know what everyone else on this team is doing, but it is surely less important, as I frequently point out. But since the time for blow-by-blow accounts of every tournament we have played has passed, we will break the silence by indulging the author in some academic content.